Flowers Disease - Many young trees, especially young birch trees, very often suffer from what we now know, world wide, as "flowers disease." People choose a tree as the perfect site for a spring garden. 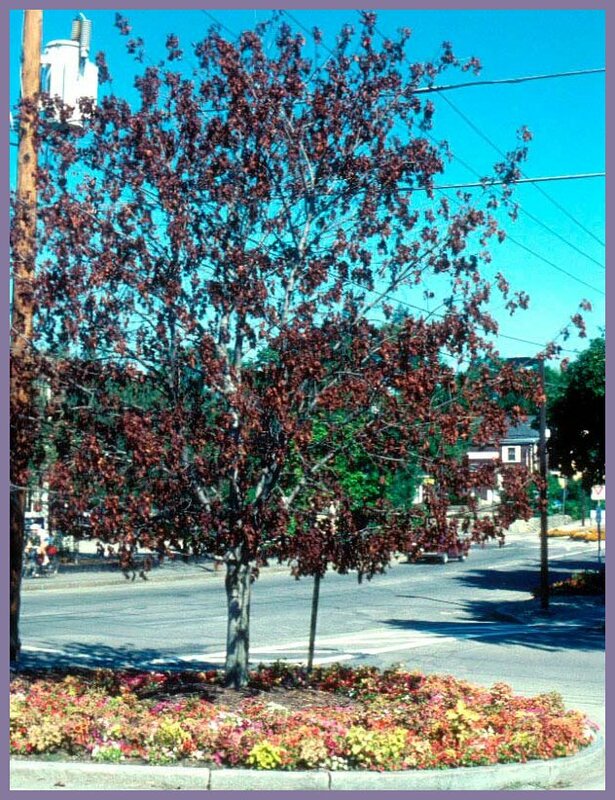 We all have seen hundreds of bulbs and annuals planted around young trees. We then see insect borers or twig dieback along with sun scold and frost cracks. Most of the trees usually die. During the planting of the flowers or bulbs they injure the roots and they usually heavily fertilize the plants. Even more injurious each year is cultivating the soil around the tree. (Picture - Flowers look good but the tree died) The only treatment is to be on guard and keep the trees well watered while removing dying wood properly. One alternative is to bring in an old log and place this log under the tree. The old rotten logs act as big sponges and thus being a moisture reserve for the tree during extensive dry spells. They will cultivate no soil and microorganisms take winter vacations in the logs. Then plant ferns or flowers within the log. ONLY FERTILIZE WITH ORGANIC FERTILIZER IF NECESSARY. Note: Choosing flowers that would do well in the shade would then be wise if the area is shaded. Click here for Eco-Art Flowers.